When you think about it, this is the story of a hit man who falls in love with a 12-year-old girl; hardly a stone that can be cast in the cinematic pond, without a ripple or two worrying the studio. Several cuts were made both in the shooting script and after production to ensure this relationship between the killer and his charge remained fatherly. I have to imagine that thankfully the film is much better for it, and Leon manages to hit the viewer with enough action and emotion to make it a memorable experience, whose poster adorns many a wall, across the student population. In the capable hands of the matchless visual stylist Luc Besson, we get enough finesse and imaginative direction to more than make up for the conceptual idiosyncrasies that have plagued his career. Set in a series of grimy New York hotel rooms, Leon walks the tightrope between French art-house and Hollywood action movie with a remarkable grace and facility, unified in theme and style by an outstanding musical score by Besson regular Eric Serra. This is one of the first films I enjoyed where the Hitman was successfully personified as being more than his career. The film may have a well-groomed director of photography, it may have stylistic confidence, but does it have a convincingly slight characterization at its focal point? This is a rare combination of disparate elements that somehow work wonderfully. 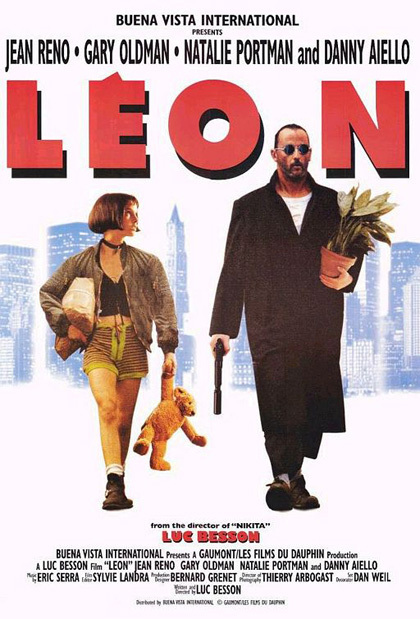 A ready sense of humour and portions of blistering suspense make Leon a formidable and never bettered entry into Luc Besson’s crowded filmography.